LONDON (Reuters) – AstraZeneca’s new drugs performed strongly in the second quarter, offering a glimpse of better times ahead as the company struggles with falling sales of cholesterol fighter Crestor due to generic competition. Cancer medicines were a highlight, including demand for Imfinzi, following U.S. approval of the immunotherapy in early lung cancer, and Chief Executive Pascal Soriot said the company remained on track for a return to product sales growth in 2018. China was once again a bright spot, as AstraZeneca continues to outperform competitors in the world’s second biggest drugs market, where it is using digital apps and other healthcare technology to help sell its medicines. Investors cheered growing evidence of the British drugmaker’s recovery, pushing the shares up more than 2 percent on Thursday. Analysts said they were also encouraged by better than expected second-quarter profit margins, which reversed a trend seen in the first quarter. The brighter outlook comes at a time of mounting criticism of high drug prices by U.S. President Donald Trump, which Soriot sought to deflect by joining other companies in promising a pricing freeze for the remainder of 2018. AstraZeneca’s total revenue increased 2 percent in dollar terms in the second quarter to $5.16 billion, although core earnings per share, which exclude some items, fell 21 percent to 69 cents, reflecting investment behind new product launches. Analysts, on average, had forecast earnings of 71 cents on revenue of $5.16 billion, Thomson Reuters data showed. For the full year, the company kept its financial guidance unchanged. Drug sales in the three months rose 2 percent, helped by a weaker dollar, but were down 1 percent in constant currencies, which is the benchmark AstraZeneca uses for measuring its return to growth. New medicines, however, generated more than $1 billion of additional sales over the first half of the year, growing 75 percent in dollar terms or 69 percent at constant currencies. For 2018 as a whole, AstraZeneca expects a low single-digit percentage increase in overall product sales in constant currencies and core earnings per share of $3.30 to $3.50. The drugmaker has suffered the industry’s biggest patent cliff since 2012, wiping out more than half of its sales, but analysts’ now believe it is poised for one of the sector’s fastest growth rates in the coming years. Key to this are new cancer pills Tagrisso and Lynparza, as well as the infused treatment Imfinzi, which has stolen a march on established immunotherapies from Merck, Bristol-Myers Squibb and Roche that are focused on advanced disease. 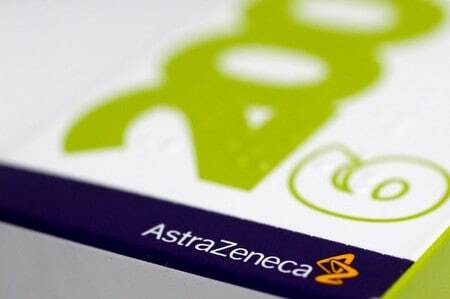 All three cancer drugs beat analysts’ forecasts for quarterly sales, as did AstraZeneca’s new biotech asthma treatment Fasenra. Following the U.S. green light for Imfinzi in February, the European Medicines Agency is also evaluating it in inoperable stage III lung cancer – where disease has not yet spread around the body – and could recommend it as early as this week. AstraZeneca’s re-emergence as a drug company with a strong pipeline of new medicines contrasts with the story at British rival GlaxoSmithKline , which is just starting out on a program to reboot its drug discovery efforts.